When you layer a smoothie it gives a unique flavor. You will actually be able to taste each fruit instead of them all being blended together. I really liked the layering technique and will make more smoothie combos using it. This was a combination of Blueberries, apricots, and bananas. SOOO TASTY! 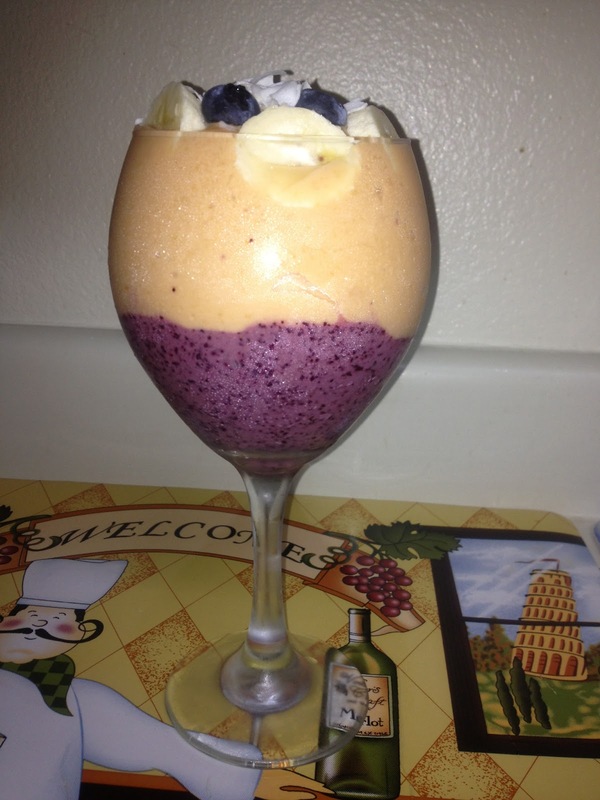 For bottom layer use a handful of organic frozen blueberries mixed with 1/3 cup coconut milk. (Add more liquid if needed I always start with less) I used coconut milk Order Here because it will give a thicker texture to the bottom layer (Note: If you prefer a less thick texture than add in 2 tablespoons of almond milk to the coconut milk as well to help loosen the mixture.) Add 1-2 tablespoons of sweetener then blend. I topped mine with blueberries, bananas, and coconut shreds. You can top yours with your favorite fruit. Eat right away its yummy! Enjoy! I made this two days in a role. I topped my other one with chia seeds and coconut shreds. Have fun and be creative with it. Keep the questions and feedback coming! You all are so encouraging and supportive I truly appreciate all the love ;-)! That looks amazing & delicious !!!! !